Directions: In a bowl, combine the first seven ingredients; set aside 3/4 cup. Place chicken in a large resealable plastic bag; add remaining marinade. Seal bag and turn to coat; refrigerate for 30 minutes. Drain and discard marinade. In a large nonstick skillet or wok, stir-fry chicken in 2 teaspoons oil until it’s no longer pink. Remove and keep warm. Stir-fry broccoli and carrots in remaining oil for 6 minutes. 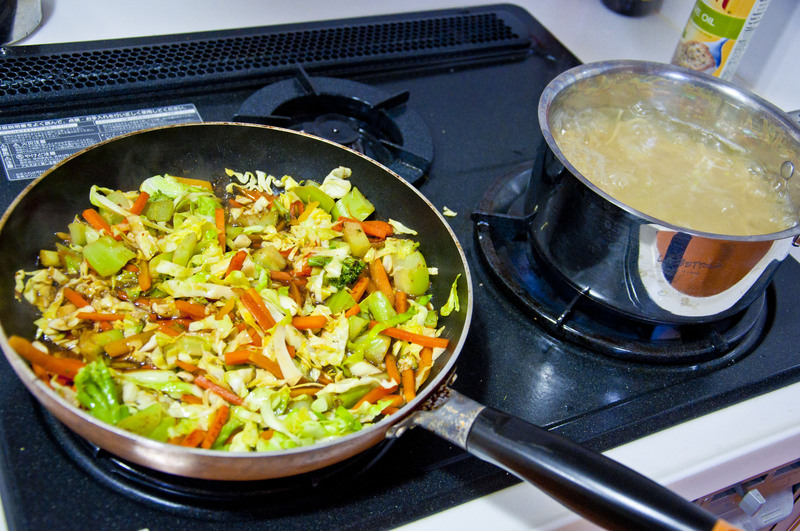 Add cabbage and peas; stir-fry until vegetables are crisp-tender. Meanwhile, cook pasta according to package directions. Combine cornstarch and reserved marinade until smooth; add to vegetable mixture. Bring to a boil; cook and stir for 2 minutes or until thickened. Drain pasta; stir into vegetable mixture. Return chicken to the pan; cook and stir until heated through. Yield:6 servings. Nutrition Facts: 1-1/3 cups equals 258 calories, 5 g fat (1 g saturated fat), 33 mg cholesterol, 672 mg sodium, 32 g carbohydrate, 4 g fiber, 20 g protein.